If you have any questions regarding this carpet please send us your question. We are happy to help you! Message : Hi, I found this rug on www.rugsandbeyond.com and I think it would be great for your home! - This Sari Silk handmade beauty does not require any caption. - It is an absolute gorgeous beauty handmade in recycled Sari Silk. - The colors are bright and vibrant. Main colors are various shades of blue with tiny floral motifs yellow. - It has an intricate border with tiny motifs. The design of the rug appears like a set of motifs tied in unision. - This is 100% washable and is most ideal for a space with light interiors. 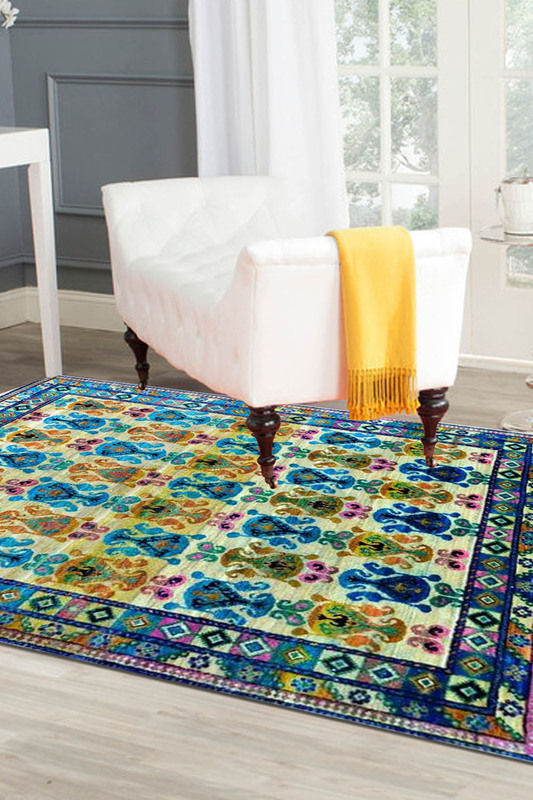 - Due to its stunning colors, this rug would add life to any room it is placed in. To maintain the condition and extend the life of your rug, vacuum regularly in the direction of the pile. Clean liquid spills immediately with a damp cloth or sponge to absorb as much as possible. For hard to remove stains, professional rug cleaning is highly recommended. Avoid direct and continuous exposure to sunlight. Do not pull loose ends, if any. Use a scissor to clip the same. All of our rugs are professionally washed and are individually inspected before leaving our warehouse. This rug is currently in stock and includes FREE shipping worldwide. Please note that lengths and widths may slightly vary from published dimensions although we strive to provide the most accurate measurements possible. Also, we do try our best to display the most accurate images. There might be a slight variation in color between the actual product and your screen due to difference in computer monitors. Copyright © 2015 Rugsandbeyond.com Yak Carpet Private Limited. All Rights Reserved.